The theme of this exhibition is works that the artist feels are something new or different with their own practice over the year. These are not necessarily 'finished' as such, but instead provide stimulus to a discussion as to what has happened over the last twelve months. David Sullivan, Harvey Taylor, Ehryn Torrell, Fionn Wilson, Sean Williams. 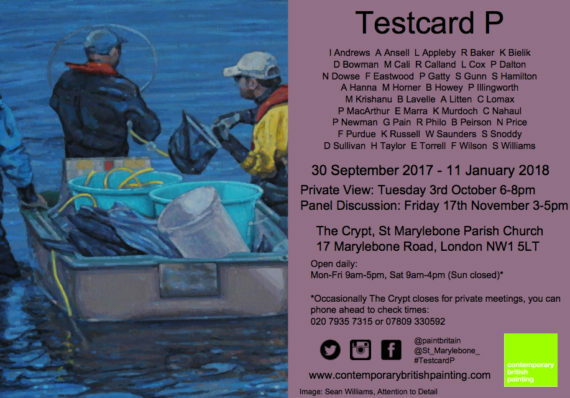 Over the last few years, Contemporary British Painting has staged a program of exhibitions in the crypt of St Marylebone Church, one of the aims has been to provide a forum for discussion on current painting practice. As underlined in the recent group show Anything Goes? at Art Bermondsey curated by Anna McNay, the one thing that characterises contemporary painting is that each artist pursues a very individual practice. Gone are the days when ‘isms’ gave us useful labels by which to identify an art movement as defined by a group of artists. Instead current painters borrow, beg and steal from every imaginable source in service to the art to which they are devoted. Alongside this, each artist, painter or not, engages in an ongoing dialogue with her or his peers, of which there is a vast pool both historically as well as currently. This dialogue takes place in as many ways as there are of approaching the making of art, from direct copying to responses alongside or in opposition to someone’s work. In any case, the very nature of painting is one of putting in the hours in whatever serves as a studio, a hermit-like pursuit in front of a flat surface. Each painting produced with this intention, is itself a strong statement that adds to the mix and then seeds others in turn. With this in mind, the theme of this exhibition is works that the artist feels are something new or different with their own practice over the year. These are not necessarily ‘finished’ as such, but instead provide stimulus to a discussion as to what has happened over the last twelve months. As such, they might be sketches, drawings or indeed completed canvases. The new or different area of practice could well be a radical departure or indeed very slight. In either event, the purpose of this exhibition is not necessarily to showcase completed works that might be considered ready for sale in the usual sense. Instead, the artists have very generously opened up their practices and have invited us to experience something that they feel is worth discussing. Contemporary British Painting is a strong community and this is a great opportunity to see what normally does not leave the studio. It gives a chance to be with the artist and view, meet and discuss what is happening right now. Contemporary British Painting is an artist led organization which explores and promotes current trends in British painting through group exhibitions, talks, publications and the donation of paintings to art museums. We are currently curating the touring show Contemporary Masters from Britain which opens in Nanjing, China in October 2017 and collaborating with Paintings in Hospitals on a show in the Menier Gallery, London in June. Our members represent some of the most exciting emerging and award winning painting in the UK today and include European Sovereign Painters Prize winner Susan Gunn, Pollock-Krasner awardee Kelly Jayne, East London Painting Prize winner Nathan Eastwood, John Moores Prize winner Nicholas Middleton, British Academy awardee James Quin, Birtle Prize winner Simon Burton, Venice Biennale exhibitors Marguerite Horner and Phil Illingworth and Griffin Prize exhibitor Matthew Krishanu. Contemporary British Painting works in partnership with the Priseman Seabrook Collections. Press Release written by Marco Calí.